Friday, November 22Doors 7:30, concert 8:00.$10 students, seniors and the unemployed; $13 in advance; $15 at the door.Tickets - http://www.brownpapertickets.com/event/461823 The Bombadils are a ridiculous and kind-hearted bunch of rascals disguised as a four-piece folk band. Originating from Vancouver, Edmonton, and Halifax, they met in 2009 at McGill University's Schulich School of Music in Montréal, where they were pursuing their studies in jazz and classical music. These musical influences carry over into their love of folk music which includes Irish, bluegrass and Canadian and American old time.Anh Phung, on Irish whistles and flute, is a stunning presence and spunky improviser. She has twice been awarded the Galaxie Rising Star Award as well as 1st place in the Canadian Music Competition. She performs regularly with notable artists such as blues man Carl Tremblay and John McGale, of Offenbach. Anh plays as though through telepathic communication with kooky and happy-go-lucky fiddler and vocalist, Sarah Frank. Sarah has traveled the continent performing and studying with key figures of traditional folk music such as Peter Yarrow, (Peter, Paul, and Mary), Alasdair Fraser, Natalie Haas, Laura Cortese, and Pierre Shryer. Luke Fraser on guitar, mandolin, and lead vocals grew up on the musical traditions of Nova Scotia, where he has performed as part of the vibrant Maritime music scene, including The Rankins' own Red Shoe Pub and the Halifax Jazz festival. Evan Stewart, upright bass, has performed at the Montreal Jazz festival and has shared the stage with award-winning musicians such as Steve Turre (Best Trombone and Best Miscellaneous Instrumentalist in JazzTimes, Downbeat, and Jazziz), Jim Head and Kent Sangster (Juno nomination, Western Canadian Music Award). 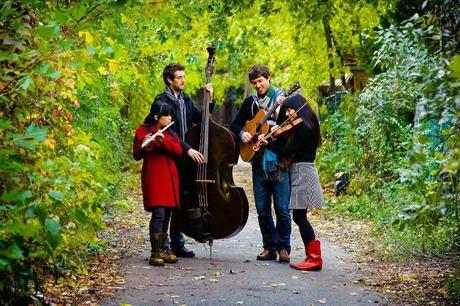 Coming together as The Bombadils, these four diverse musicians perform a combination of traditional and original music, both instrumental and vocal, both English and French, both improvised and through-composed. For the past three years they have been performing regularly throughout Québec at pubs and cafés, local dances, weddings and concerts. Since their graduation from McGill University's Schulich School of Music, The Bombadils have released their debut CD "Fill Your Boots!" and continue to perform across Canada.